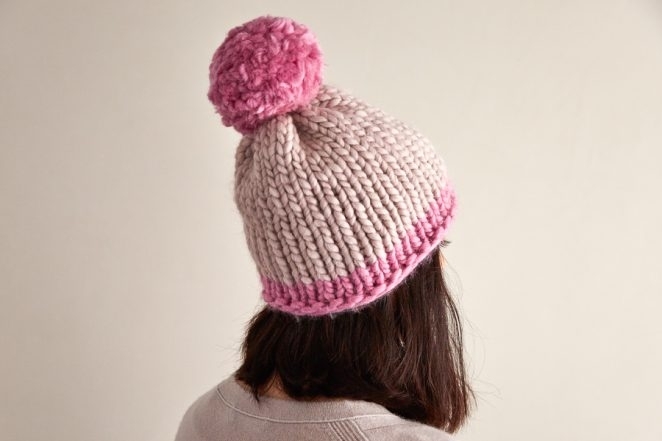 It truly is time for a Homestretch Hat, but this hat is not only a super quick knit, it’s also a real mood lifter! 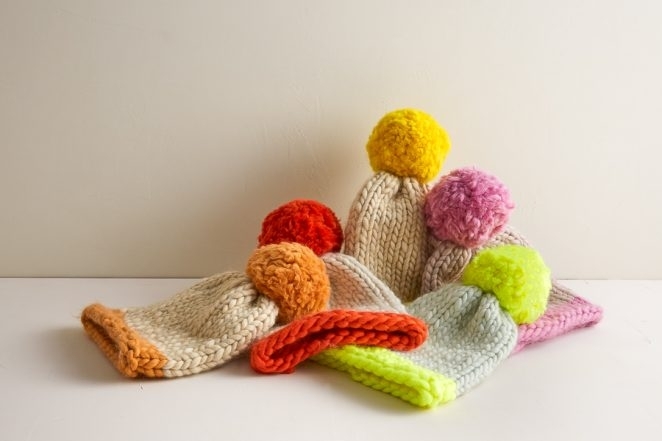 Soft and cozy, colorful and exuberant, our Two-Color Homestretch Hats really bring the holiday spirit! The secret to calmly making it through the weeks leading up to Christmas is our quick jumbo Gentle Giant merino wool, plus this pattern that requires no double pointed needles and no decreasing. 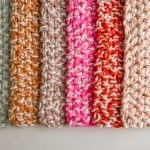 Just knit a tube, cinch the top, add a big, fluffy pom pom, and you’re done! 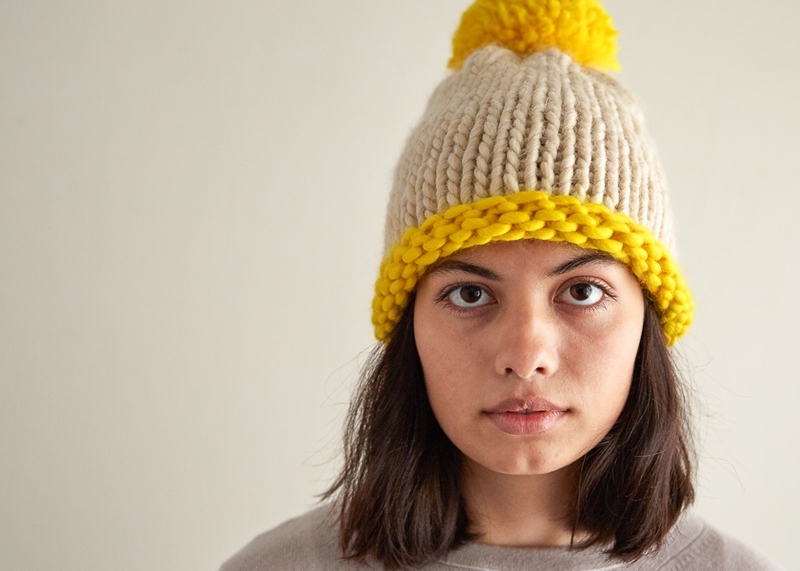 This no-fuss design means it’s perfect for brand new knitters and a boon for experienced ones. Based on last year’s one-color version, this year’s Two-Color Homestretch Hat takes advantage of our newly expanded Gentle Giant palette. Tone on tone or high contrast, there’s a combination that will suit every single personality on your list. In just an hour or two, you can make a gift that will be far more memorable than anything you purchase out of pressure. The Two-Color Homestretch Hat not only solves the last-minute gift challenge, but making it will calm your nerves and warm your heart! 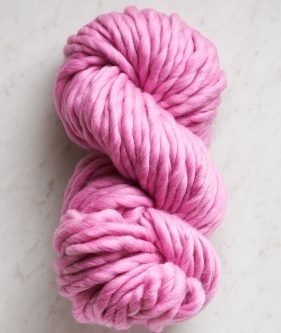 NOTE: This is enough yarn to make one hat, except you can make two Baby size hats if you switch the colors. 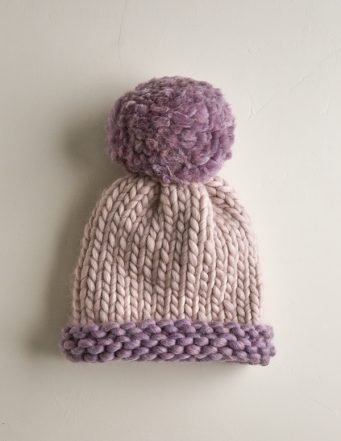 Also, if you omit the pom pom, two skeins is enough to make two hats in any size, reversing the colors. 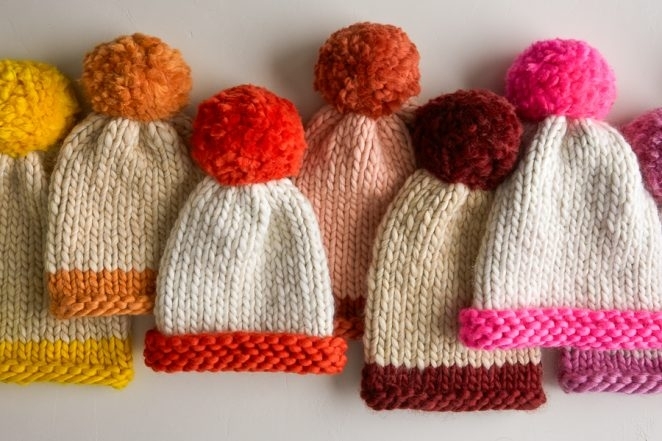 To make the Two-Color Homestretch Hat, simply follow our original Homestretch Hat pattern, casting on with the Contrast Color and knitting the first 5 rounds with it. Switch to the Main Color to finish and add a Contrast Color pom pom to the top! 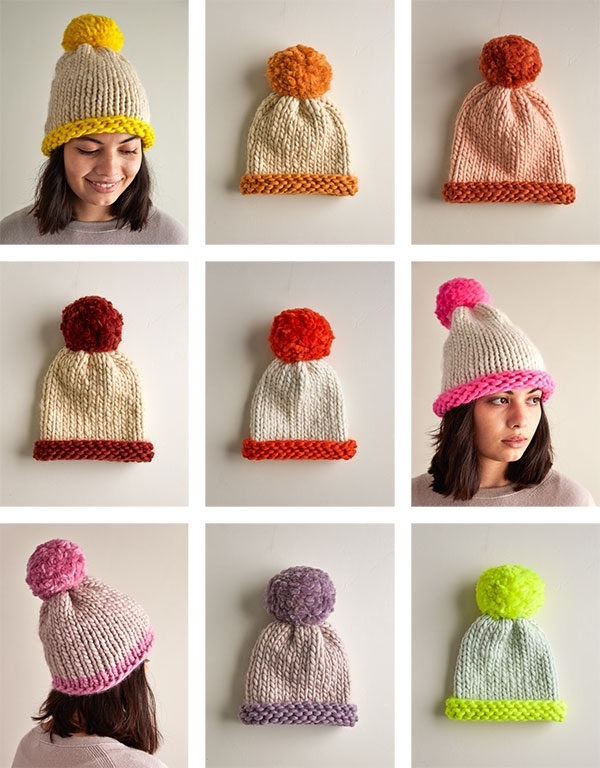 For the free pattern, visit out original Homestretch Hat story! Thanks for another great pattern. 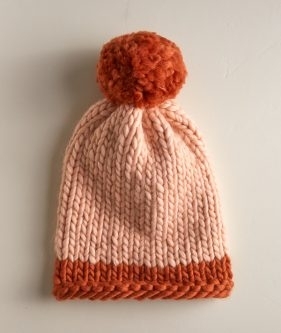 The original homestretch hat calls for alternating purl and knit for the first two rounds, and then knitting the remainder. To get the 5 rows of “bumps” as shown here, should I purl the first 5 rows? Thank you for reaching out! 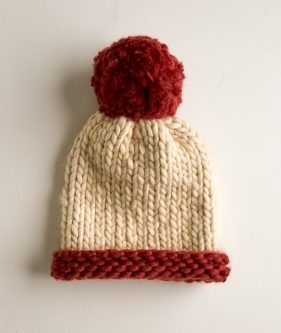 To create the two toned version of the hat you simply knit the first five rows of the pattern in your contrast color. After you have knit your hat you can choose to either cuff the brim of the hat or leave it as is. 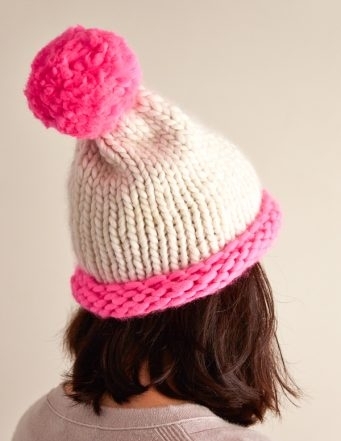 If you do not cuff the brim you will have two rows of bums and three rows of knit in the contrast color. 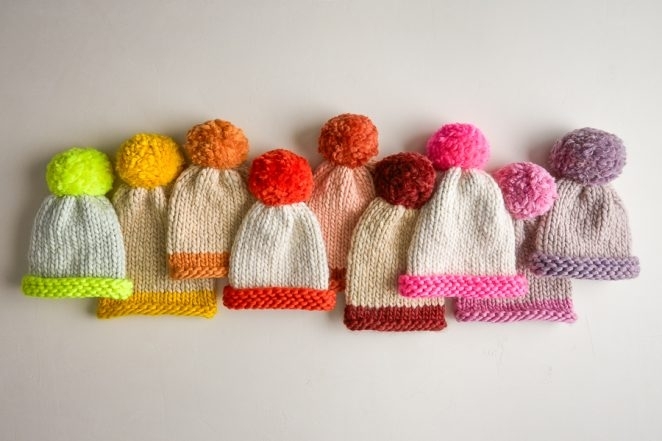 The hats that have five rows of purl bumps have just been cuffed. I hope this clears things up and please let us know if you have any further questions! These are so beautiful! 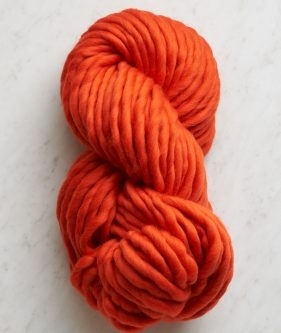 I’m excited to knit up a few for gifts. What would you guess is the age range for baby vs kid size? Thank you! Thank you for reaching out! This all really depends on head circumference. The circumferences of the hat sizes are as follows 14 (16, 18, 20) inches. In my experience it is always better to go a little bigger rather than a little smaller when it comes to knitting for kids. I hope this helps and let me know if you have any further questions! 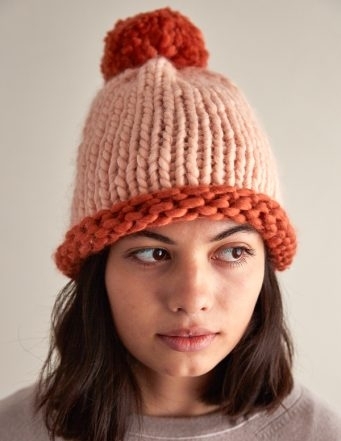 I love this hat and want to make it, but I am not sure I want to buy size 17 needles. My question is, would it be as fun with smaller needles, say size 13? I know I would have to check the gauge. Have you made it with smaller needles? Thanks for writing in! We do call for US 17 needles for this pattern. If you can get gauge with a US 13, you should be good to go. However, unless you are a very loose knitter, this may be a challenge as the difference in needle size is so great. When we have tried Gentle Giant on US 13 needles, the fabric has been very tight with very little drape or elasticity and quite a bit smaller than swatches knit with a US 17. You can certainly try a gauge swatch with US 13. I do think that you will want to use a US 17 for this hat. Yes, this helps a lot. I’m going for the 17s. Thank you! I love your patterns, but am wondering if you could post some patterns for straight (not double pointed needles), or provide instructions for how to convert circular needle patterns to straight . Thanks so much! Cheers! Thanks for writing in and for sharing your concerns! While we use circular needles for most projects, if a project is not worked in the round, you may be able to use straight needles. Most of our scarves and wraps can equally use straight or circular needles. The reason we sometimes use circular needles for flat knitting is to accommodate a lot of stitches. Cramming a blanket’s worth of stitches onto long straight needles can be pretty cumbersome and sometimes even, impossible. To use circular needles for knitting flat you simply finish a row, turn the work so the other side is facing you and put the needle that was in your right hand into your left hand and the needle that was in your left hand into your right hand, ready to go on the next row! 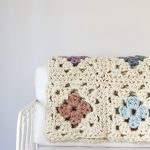 For patterns that are worked in the round, converting to using straight needles can sometimes be quite and intensive process that essentially involves reworking the pattern in its entirety. While we do not have the resources to do so, we will certainly keep you request in mind. Question about your gauge: it says “7 stitches and 10 rounds = 4 rounds.” Do you mean = 4 inches? I am working with yarn that is 2 stitches = 1 inch, so I want to make sure I correctly interpret the gauge you are basing the pattern off so I can scale up correctly. Thanks! Thanks for writing in and thank you for catching that! It should be 4 inches and we have corrected it! Thank you again and happy knitting! Thanks! 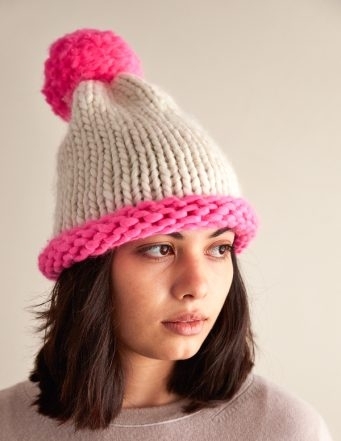 Also, just to make sure I’m going to end up with the brim the way it looks – it says to cast on and knit the first 5 rows with the contrast color. 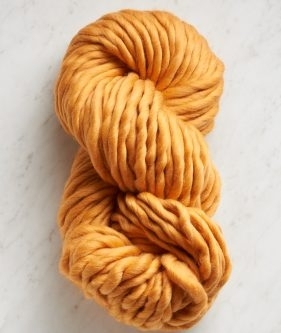 Due to the pattern, is this a cast on, purl round 1, knit round 2-5, then change to the main color and continue knitting the rest of the rounds? Thanks for writing in! You are correct! 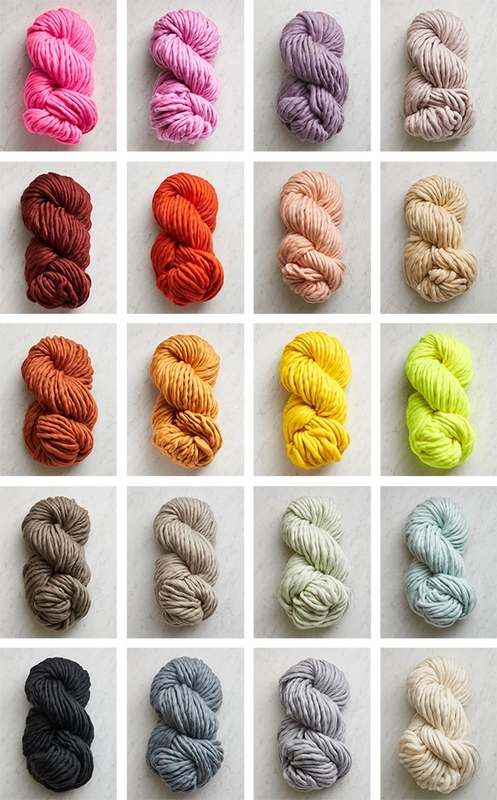 For the two color version, you will follow the directions for the 1 color version but your cast on and rows 1-5 (including the purl row) will be using the contrast color! I love your colored can this be make for men or boys? Thanks for writing in! Absolutely! This hat works well for men and women alike! Just pick colors that would work best for your recipient and you should be good to go! Hi! Can you please provide a little more instruction on how to change colors? I’ve knit my first 5 rows and realized I don’t exactly know how to change colors!! Do I cast off and then pick up stitches? 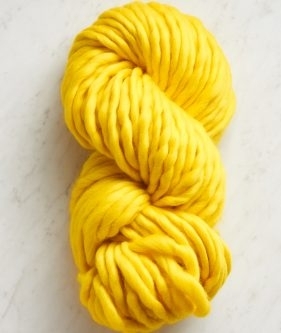 Or do I just cut the yarn at the end of a round with a little extra tail at the end and then start with the new color, weaving the ends later? Thanks for writing in! 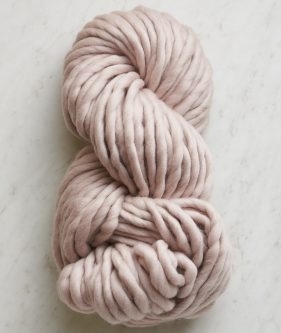 To join a new color of yarn, stop knitting with the old ball when there are at least 8 inches of yarn remaining. To begin the new ball, put the right needle into the next stitch. Leaving an 8-inch tail of the new yarn, begin knitting with the new yarn as usual. Do not tie a knot. This leaves two tails. 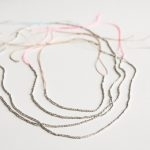 It also leaves stitches that seem loose and a small hole in your knitting, but never fear! You will fix this at the end of the project when you weave in the ends. At that point, you will cross the tails so that you weave the right tail to the left of the hole and the left tail to the right. 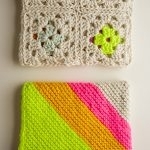 Thank you for the patterns to knit by. 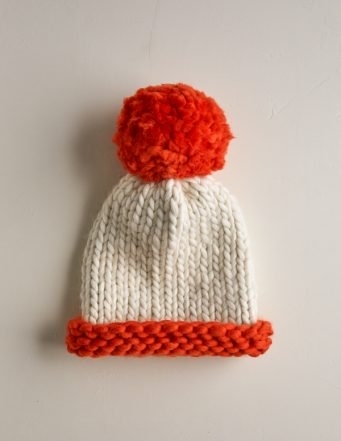 I feel rather foolish, but I don’t know how to attach the Pom pom to the hat. Help, please! No need to feel foolish! 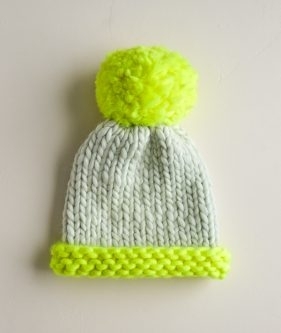 There is not one way to attach a pom pom and I think that most of us have un-vented a way that works for us! For me, I take one of the two ends of the middle tie and thread it on a tapestry needle and pull it through the top of the hat to the underside of the hat. With the second end, I do the same thing, making sure to pull in through to the underside 1-2 inches over. 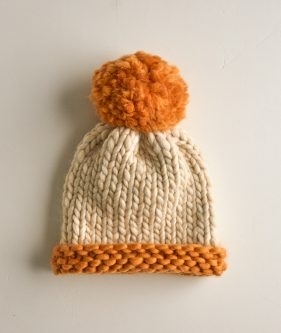 I then tie the the two ends into a square knot on the underside of the hat and weave in the ends. I might also suggest searching YouTube for a tutorial, I am sure that they are out there! Great hat, just love it! I would like to know if I can use straight needles instead of circular? I’m way more comfortable with straight ones. Thanks! Thank you for your kind words! This pattern is only written to be knit in the round, but you can adjust the pattern for straight needles. 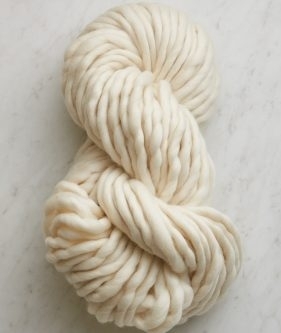 Be sure to cast on extra stitches to allow for seaming! 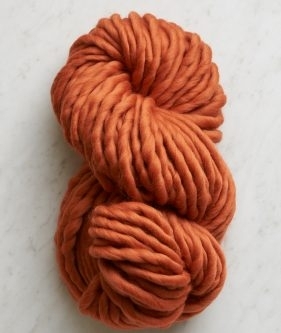 What size/weight is this yarn? Is it larger than a 6/Super Bulky? Thank you for reaching out! 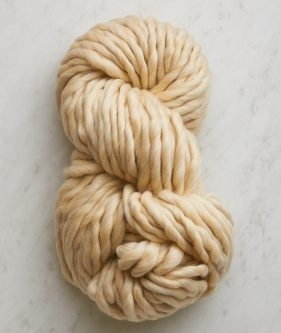 This yarn has a gauge of 1.5 – 2 stitches per inch on US 17-19 which is at the largest end of what is considered a Super Bulky. 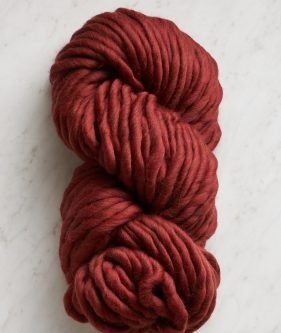 I would say this yarn thicker than a true Super Bulky, but If you are thinking of using a particular yarn I would compare your yarns suggest gauge with our Gentle Giant yarn. 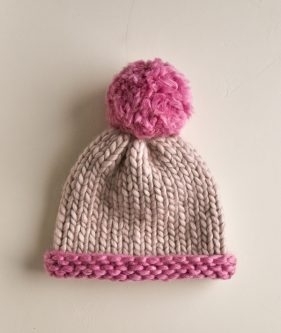 Is there a way to make this hat with a decrease so it is not as pointy? Thank you! Thank you for reaching out! You can certainly add decreases to the pattern, though because it will create an angle it will have the opposite effect and create a pointer hat. 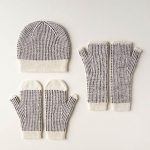 Our Monogramed Hats for Everyone or our Friendly Fair Isle Hat pattern which do use decrease, but also use a thinner yarn to create a rounder top. 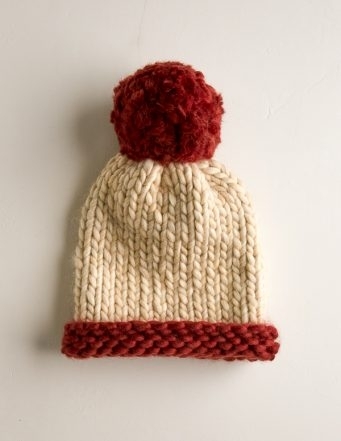 I just knit the Homestretch hat and really like it. It was fun and fast. I do have a question about the pompom. 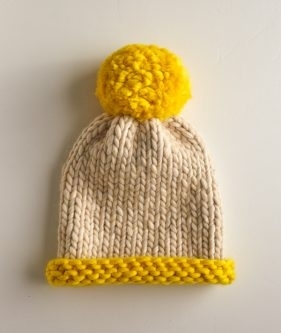 Did you use the Gentle Giant yarn to make the pompom? Thanks for writing in! 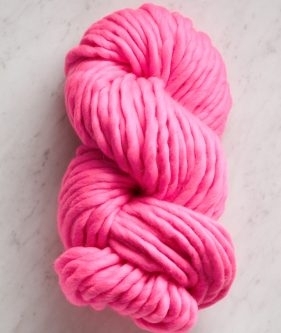 Yes, we did use Gentle Giant for our giant pom poms! 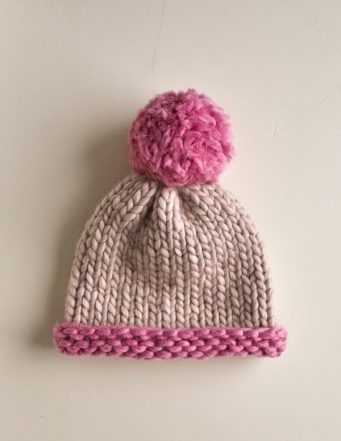 It creates a really fluffy, fun hat topper! 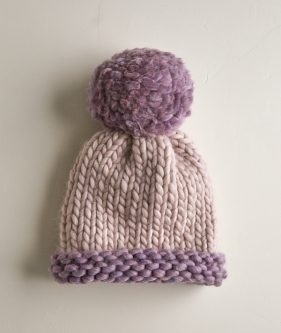 Could you please advise what size pom is on the hat? 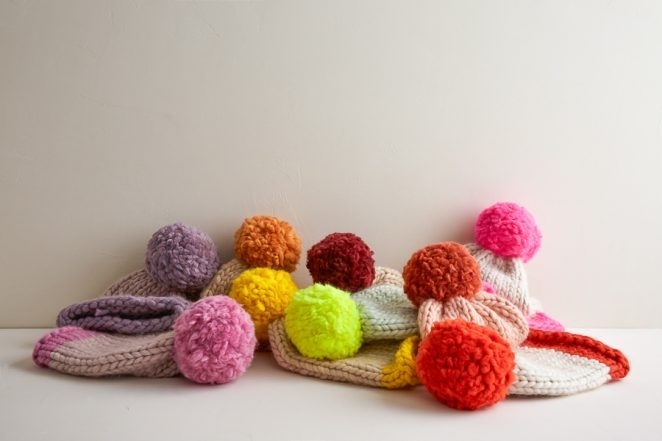 I have the pom pom kit as well as a regular round pom maker. What do you recommend? I have not done either yet! I am happy to help! 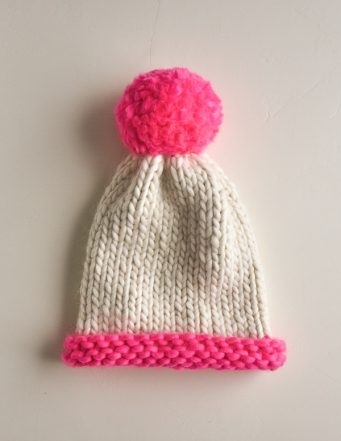 For this hat, we used the larger of the two pom pom markers included in the pom pom maker set! 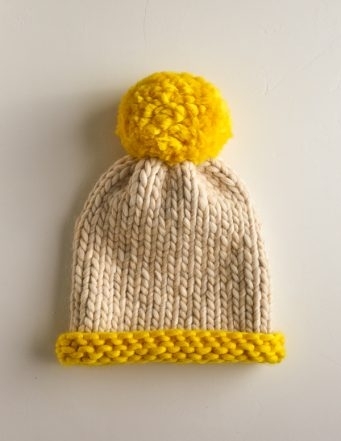 I have your great pom pom kit – just about to start this hat – any advice for how many wraps on the pom pom maker? 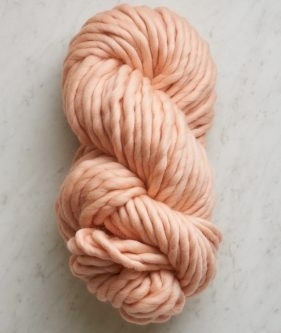 (I’ve never tried it with yarn this thick and I don’t want to waste any of that beautiful yarn!) Thanks! Great question! 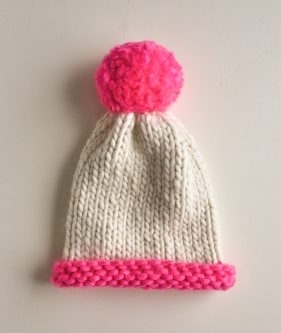 We don’t have exact guidelines for using our Pom Pom Maker Set with super bulky yarn, but I would try about 80 revolutions for a large pom pom. The wraps on the pom pom maker should be quite full, but not so full that you can’t tie securely around them. 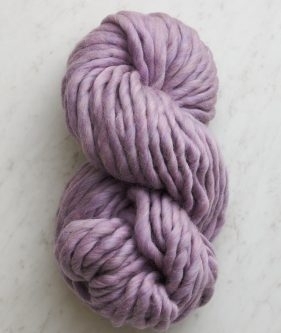 I have some left over your Soft Merino that uses size 11 needles. 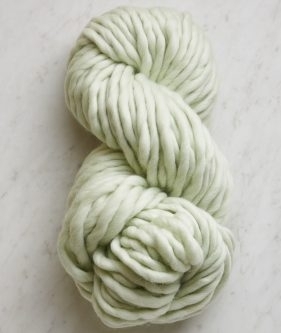 It looks similar to the Gentle Giant yarn, just not as large of a gauge. 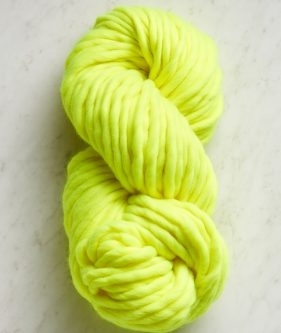 Could you estimate how many stitches to cast on for the adult large using the soft merino yarn ? Appreciate your help ! Thanks for reaching out! 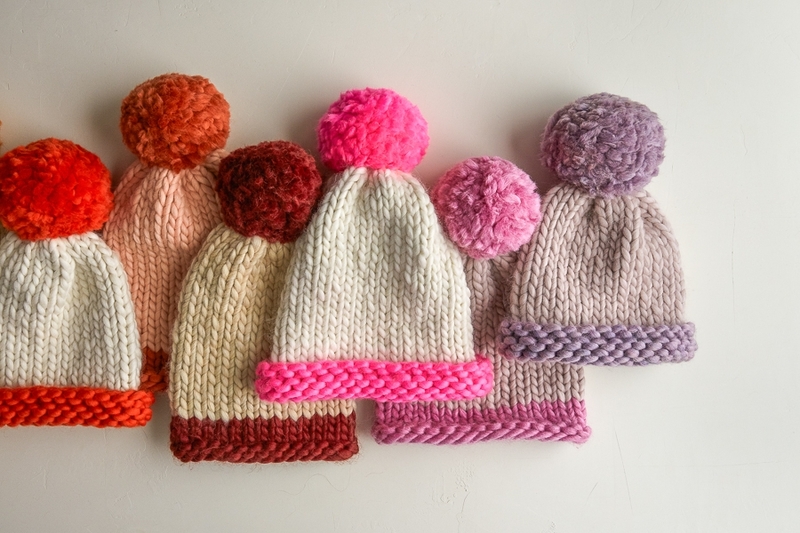 Changing the gauge of the pattern from Gentle Giant to Super Soft Merino would be quite a jump and would require extensive pattern adjustments; however, our Speckled Pom Pom Hat is almost identical to the Homestretch Hat and is written for Super Soft Merino! 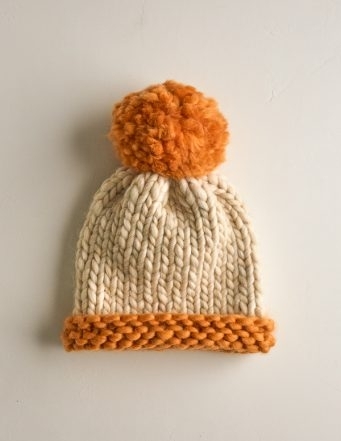 You could knit the first two inches of the hat in a contrast color if you wish.